I like to cook and when we have been cruising previously a good part of the day-every day- is centered around meals. I love to fix a big omelette loaded with veggies or French toast for breakfast. Lunches are pretty light and fast but for dinners I go all out again. Fresh caught fish (hopefully), some sort of salad, veggie sides, fresh bread of some sort, and homemade sauces. We really don’t subscribe to the “camping” style of eating while sailing. So it may seem surprising that I just received a large delivery of freeze dried food stores delivered in the mail this weekend. First. Yes, I know there is food everywhere. Yes, I know it helps to stimulate the local economy to shop local. And, yes, I know most vegetables/fruits can be stored for quite a while when stowed properly. I plan on doing all of the above, but I was still looking to find ways to limit the amount of processed and pre made meals. Basically, I want to have the ingredients to make my own soup instead of pouring soup out of a can. 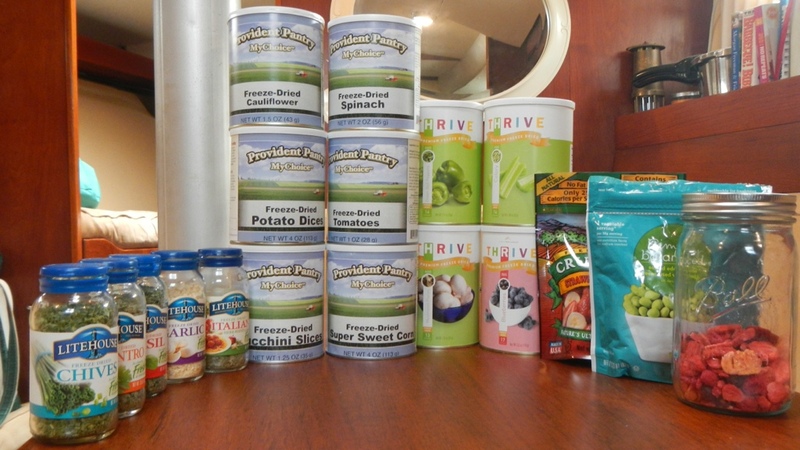 I started getting curious about the freeze dried foods. Apparently they retain about 90% of their nutrients, have no preservatives or salt, and have a 10-25 year shelf life (unopened). Their texture and taste is supposed to be similar to fresh or frozen. Sounds great-load me up! 2) In a recipe that I think will be best suited for the freeze dried. 3) In a new-to-me recipe that looks like it would be good to add to our cruising menu. 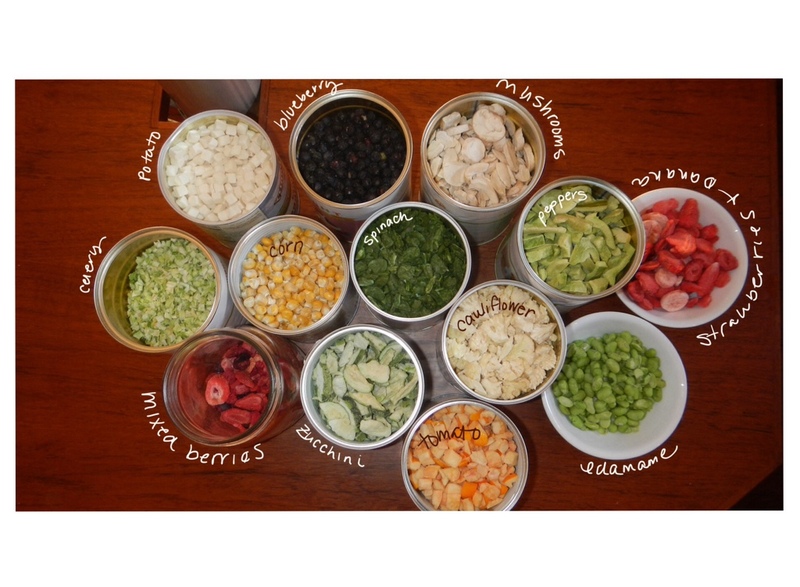 I plan on using a mix of fresh, canned, and freeze dried foods-just like I plan on doing in the islands. I’m not trying to make my own MRE meals here. So, I guess the test kitchen galley is open! Here is a list of my trial ingredients I have to work with. I also picked up chives, cilantro, garlic, and basil freeze dried herbs to play with. I left the meats, dairy, and grains alone for now. I’ve seen freeze dried ice cream, strawberries, bananas, blueberries before. Even some freeze-dried meals in the camping section at Walmart or Dicks Sporting stores. Yeah, I had always thought of it as survival food before and was only familiar with the meals. I wasn’t interest in it until I found the plain vegetables. Although the blueberries are what have me most curious right now. I have a lot of fun “experiments” planned. Spinach and mushroom omelettes , blueberry muffins and pancakes, fajitas, grilled pizza, stuffing…I’m hoping at least some of them are winners. We will see.